Thailand is a paradise for scuba divers with plenty of different diving spots that offer diverse marine life. And one of the top places to explore the underwater world is Koh Tao. Often known as the Cairns of Southeast Asia, the small island of Koh Tao packs a strong punch for travellers who want to learn scuba diving. The baby island (also known as Turtle Island) of the Koh Samui, Koh Phangan and Koh Taotrio, is a tropical dream attracting over 100,000 travellers each year, especially for its diving sites. On my travel to Thailand, I knew that this is one destination I would not miss. Here’s what happened when I went under the sea at this paradise. 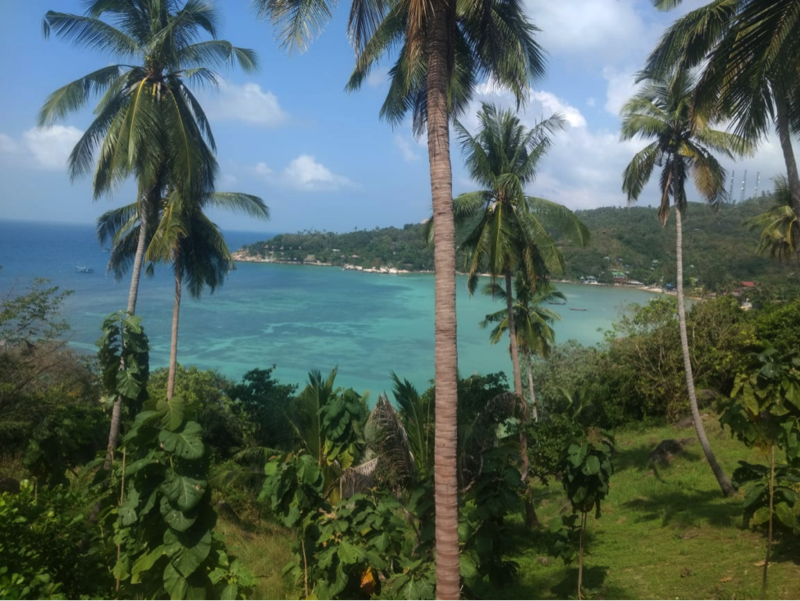 Koh Tao in Thailand has a few of the most beautiful and exquisite diving sites that are easily accessible, something that other island either lack or don’t have easy access to. I chose this island because it offered some of the finest quality of marine life and clear waters along with affordable and credible dive school. The proximity to Koh Phangan, home of the full moon party, was also a deciding factor. In addition to the underwater marvels, the island has interesting sightseeing and good vibe. I went to the John Suwan viewpoint that offers a breathtaking view of the entire island in a single glimpse. A nice peaceful sunset on Sairee beach over the clear waters of the island, and one of the best pub crawls in Asia, were definitely the highlight of my trip. Another good place to visit is the nearby Koh Nang Yuan Island which is actually a group of three small islands connected by a small strip of sand between them. It is like a beach in the middle of the ocean. Scuba diving has always fascinated me because that is the closest you can get to the feeling of flying (skydiving is just falling and not flying) and it opens up the submerged world to you. And to become a certified scuba diver, having an open water dive certification is the bare minimum you need to achieve. I did an SSI Open Water Dive Certification. With that certificate you can dive anywhere in the world as long as the dive site is less than 18 metres deep. The next natural progression is an Advanced Scuba Dive course which I intend to do soon. 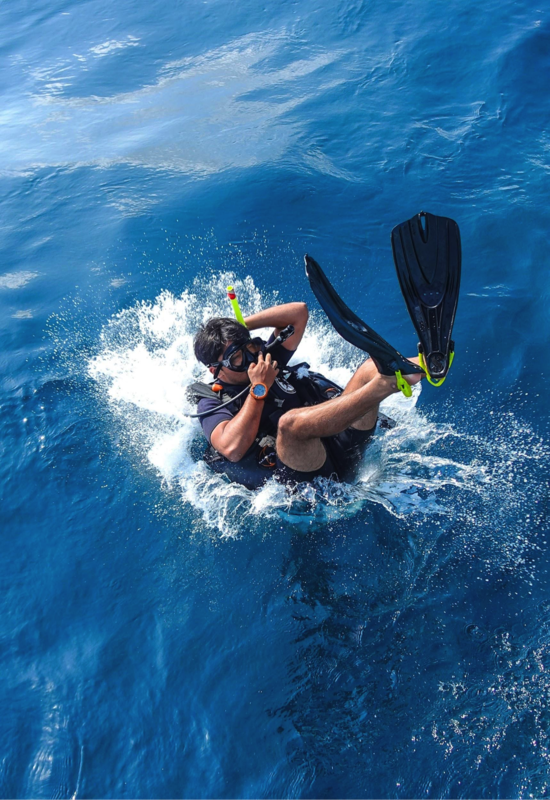 All diving school need you to fill a form mentioning your critical illnesses or injuries, and that you are willing to undertake the risks that come along with scuba diving. Don’t worry, scuba is perfectly safe, and this is mandatory precaution on the dive school’s end. There is a basic swimming test that you need to pass. It is to know if you are comfortable with water. Apart from these, there are absolutely no pre-requisites. Anyone and everyone can take this course. Open Water consists of a three day training programme. Day one is getting used to your equipment while training in a pool. They teach you the fundamentals of buoyancy and navigation through water. It also involves a bit of theory about how pressure and buoyancy affect your body. Day two comprises of two dives in the open sea. Each of these dives happen at a depth of 12 metres. 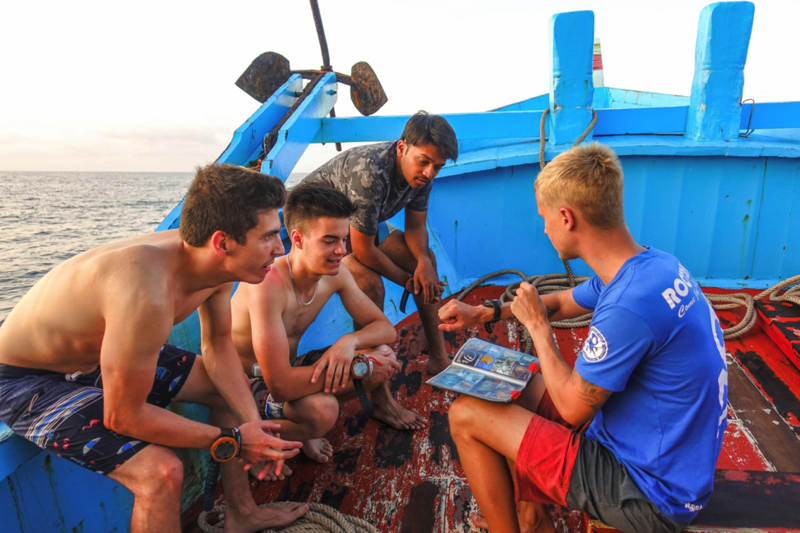 In these sessions you learn – how to put together your equipment on a boat, how to enter the water, how to deal with increasing water pressure, how to manage your equipment under water and some free time to just explore the marine life. Day three again comprises of two dives. Both happen at a depth of 18 metres where the pressure is even greater, but the marine life is also more beautiful. Both these dives are just fun dives. No more training. Each of the four dives last about an hour (50 – 60 minutes, depending on how quickly you deplete your oxygen tank) and you always go down in batches of four – three students and one instructor. After all your dives you have to undertake a simple exam that tests if you retain all the theoretical information. It is important since that knowledge can help you in tricky situations once you get certified. Pass that exam and you have your internationally acknowledged diving certificate, which is a license to dive anywhere in the world. The moment you reduce your buoyancy and start going underwater, you cross the horizon between earth and heaven. From the chaos of humans on the surface you suddenly enter a peaceful realm. You are not communicating anymore. You are just observing. In my case, at first I felt a little out of place because the fish were perfectly comfortable in that environment and I was struggling to cope. But soon, I was at home and could explore. 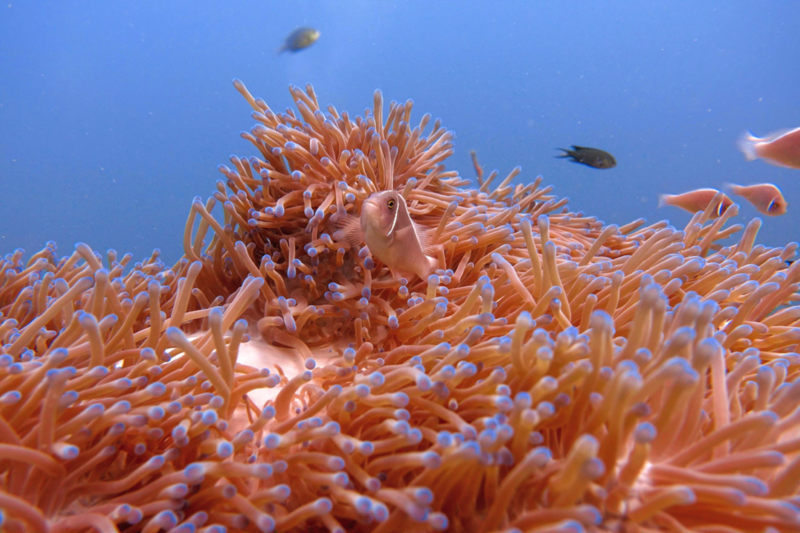 If you dive in a particularly good location like Koh Tao, you get to see a plethora of marine life. There was this incredible moment for me, when our team went to the deepest point in the dive and looked up to see a giant shoal of thousands of Barracudas going around like a Tornado above us. Their slender silver bodies glistening in the faint sunlight from a rising sun. With each dive the experience became more and more fun. Once you are comfortable with the water all around you and you stop being a control freak, it is pure fun from that point onward. In fact, I wanted to celebrate so with the others I went to a local bar on the beach that had a large display, which displayed our dive image and video. It was incredible to relive that. Even if you don’t intend to shell out extra bucks to get the video made, you can still grab a beer and enjoy videos of other people’s experiences. My personal suggestion, get the video made, especially if you dive in Koh Tao. Capturing that experience is worth it! Which Dive School to Choose? I chose Roctopus Dive School at the island. They seemed to be pretty well known in the area and have a large team of instructors. But you can choose pretty much any dive school as long as it is recognised by either SSI or PADI. You may opt for Crystal Dive, Big Blue Diving Resort or Simple Life Divers besides Roctopus. But remember, your coach should speak your language, as it is essential in learning as well as any crisis situation. – Shark Island: So surprisingly, Shark Island doesn’t have any actual sharks. It derives its name from its shape that looks like a shark fin. Located on the south of the island, this place is rich in soft corals and you can dive with turtles, triggerfish, sea snakes, and clown fish. – White Rock: Extremely close the Sairee beach (only 10 minutes by boat), White Rock is one of the largest diving sites of the island. Popular for its night dives it is home to sea turtles, blue spotted stingrays, nudibranchs, and angel fish. Here you will also discover a host of soft and hard coral. – Twins: Also known as Twin Peak, this place is ideal for beginners to explore small marine life such as sea horses and shrimps. The beauty of this place is the two large rocks which are eight and 20 meters deep that make for a lovely sight as moray eels, trevallies, clown fishes, and yellow tail barracudas swim by. Besides these you can visit other locations such as, Sail Rock – the best diving site of Thailand, Southwest Pinnacle – second best in Koh Tao, and Green Rock – for cave diving experience. – Do not try to touch the marine life. The fish and the corals are sensitive and you will inflict serious harm to them and probably to yourself if you do so. Observe from a distance. – If you want to be comfortable with water, you can try snorkelling. Ensure that you ask your trainer for snorkelling gear along with the diving one. – Be honest about your health conditions and consumption of drugs or alcohol in the last 24 hours. This can help your trainer keep you safe in case of emergencies. – The experience of scuba diving is best when you personally try it, as compared to reading online about it. So just go dive! Besides Koh Tao, Thailand has a host of other remarkable destinations for diving such as Koh Phi Phi and Similan Islands, you can read about them here. This entry was posted in Travel Diaries. Bookmark the permalink. My name is Lavanya and I discovered peace in traveling and exploring. I love experiencing the authentic culture of any place I go to, the local people and local food is how I connect with the place. Currently I work at a travel company called Ithaka and help other people enjoy traveling as much as I do.